NEW ORLEANS, La. – Records were meant to be broken, milestones shattered and new goals were formed at the 2009 Conclave in New Orleans. The record 843 attendees at the 55th Biennial Convention performed more than 2,000 hours of community service at New Orleans' City Park, attended educational sessions, elected a Grand Council, amended the Constitution and Bylaws of the Fraternity and much more. There was much accomplished and in the next two years more work to do, but the TKE Nation is up to the challenge. Watch a recap of the event. Take a look at the pictures of Conclave 2009. Follow all the happenings of TKE on the official Twitter page. In addition, several Fraters were given awards for their various volunteer work for the organization. Frater Thomas Muscarella (Pi-Mu, State University College-Buffalo) was inducted into the Advisory Hall of Fame, Frater Russell Heil (Beta-Pi, Georgia Institute of Tech.) received the TKE Educational Foundation Fraternity for Life Award, and Frater Dan Levinson (Beta-Sigma, Univ. of Southern California) received Teke Alumnus of the Year Award. Charters were also given to all of the new chapters who earned them during the biennium. The second day of Conclave provided attendees with dynamic educational programming for collegiates and alumni. The Teke Institute and Alumni Volunteer Academy kicked off Friday morning’s activities. The men scattered among several breakout rooms for sessions ranging from “Understanding the Black Book” to “Recruitment” to The Blueprint and beyond. Awards given out on Friday were to Beta-Mu Chapter for raising the most amount of funds for the Alzheimer’s Association, Frater Robert Planck (Epsilon-Omicron, Univ. of Houston) Honorary Chairman of the Life Loyal Teke Program, Paul Wineman (Phi Kappa Psi was awarded the Salisbury-Scott Interfraternity Award, Danny Villanueva (Alpha-Omicron, New Mexico State Univ.) received Teke Alumnus of the Year Award, the Lambda-Iota Chapter received the Most Improved Recruitment Award, the Beta-Sigma Chapter received the Top Recruitment Award, and Frater Domenico Sicari (Xi-Gamma, New York Institute of Tech.) received the Top TKE Recruiter. The day was capped by an amazing parade down historic Bourbon Street. The street was jammed from side to side with Tekes led by the TKE International Sweethearts from 2008 and 2009 and Frater Buckwheat. It was truly a sight to see as the tourists and natives came to windows to see what the commotion was all about. Teke flags hung in the rafters as chants of “T-K-E” could be heard for about a mile. The parade route ended at the House of Blues for a top-notch celebration with two Teke-led bands Awake in Reno and Mudflap Junkies, and WWE Wrestler and Custom Muscle co-founder Charlie Haas. They rocked well into the evening and a good time was had by all. Tekes were up with the sun on Saturday morning piling on buses for the service project. “I'm amazed at the amount of work the Tekes accomplished in less than a half a day,” said John Hopper, Chief Development Officer & Director of Public Affairs for New Orleans City Park. The more than 600 men team tackled the early morning heat, humidity, and the occasional fire ant hill clearing brush along Bayou St. John and spreading mulch along the path in Couturie Forest. With weedwackers, wheel barrels, shovels and more, Fraters took to the City Park on a mission. Even as menacing-looking clouds and thunder started to roll in, the men didn’t slow – in fact, they moved faster to complete the work. Drenched in sweat and covered in mud, the Tekes took shifts loading and unloading brush and mulch. Once the men returned from the great work at City Park, they cleaned up for the Second Session of the Grand Chapter and some more awards. Three Key Leader Awards were given out to Fraters Elmer Smith (Mu-Sigma, Moorehead State Univ. ), Anthony Clemens (Nu-Mu, Univ. of South Alabama), and John Phillips (Nu, Univ. of California-Berkeley). In addition, the Omicron-Sigma and DC Area Alumni Associations were recognized for Achievement. 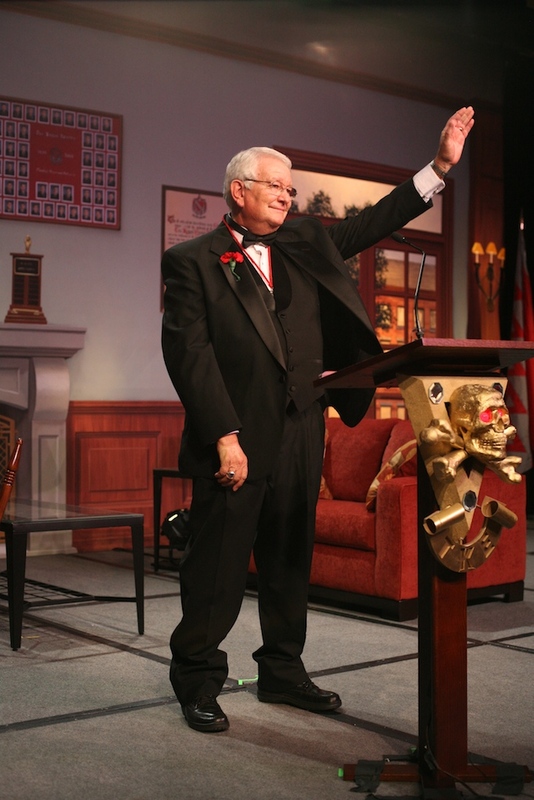 Frater John Reagan was awarded the TKE Educational Foundation Medal of Excellence. During the Inaugural Banquet even more Fraters were recognized for the great service to the organization. Frater Mark Johnson, Grand Prytanis from 2007-2009, was given a token of appreciation for his ranch in Colorado. Janice Romig (Mother of Past Grand Prytanis Mark Romig) and Natalie Johnson (wife of Past Grand Prytanis Mark Johnson) were awarded the Jean Cochran Fraternity Award. Fraters Erik Glenn (Gamma-Beta, Colorado State Univ.) and Walt Jenny (Omicron-Phi, Univ. of Oklahoma) were given the Grand Prytanis Award. Frater Shawn Babine (Lambda-Delta, Univ. of South Maine) received the Volunteer of the Year Award, Frater Tommy Miles (Xi-Chi, Southern Polytechnic State Univ.) was given the Order of the Silver Maple Leaf, Frater Charlie Trabold (Kappa-Kappa, Monmouth Univ.) received the TKE Educational Foundation Fraternity for Life Award, and Fraters Mark Romig (Theta-Mu, Univ. of New Orleans) and Mark Fite (Delta-Xi, Miami Univ.) were given the Order of the Golden Eagle Award. The Inaugural Banquet also saw the confirmation of the newly elected Grand Council of the organization. A special thanks goes to Fraters Ray Franklin (Lambda-Alpha, Univ. of South Florida) and Mike Benson (Grand Chapter), along with the crew of Stage America who helped make Conclave a show few will forget. Join us in 2010 for the Regional Leadership Conferences and save $50 by signing up by the end of August. Contact the Offices of the Grand Chapter for more information. And don’t forget about joining us in 2011 for the 56th Biennial Conclave in San Antonio, Texas.